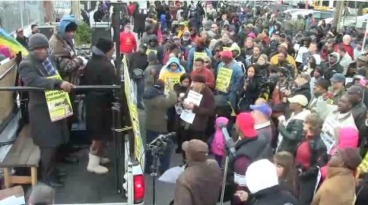 Bus drivers in Boston Massachusetts have refused to be pushed around by its new employer Veolia. Since it took over Boston school bus transport in July, Veolia showed its usual contempt for its passengers by constant route changes that created chaos, overcrowding and increased cases of lateness. Veolia's legendary contempt for its workforce was shown by its contract violations, constant shortages in paychecks and an attempt to impose wage cuts. Over 75 individual and class action grievances have been filed; the union has filed 16 charges against Veolia with the National Labor Relations Board. The Boston bus drivers had had enough. On 8th October when the drivers arrived at the 4 depots, there was a demand for Veolia management to meet with the union to discuss the company�s failure to adhere to their signed terms and conditions. They wanted Veolia to start honoring its agreements. Veolia refused. A long serving councillor, Charles Yancey, came to help start a dialogue. Veolia still refused to meet with the workforce; got the police to physically remove councillor Yancey; threatened the workers with arrest unless they leave the premises. Veolia then locked the gates. The school bus drivers had been locked out. This meant that most of the 650 buses went nowhere. Complete disruption then followed. 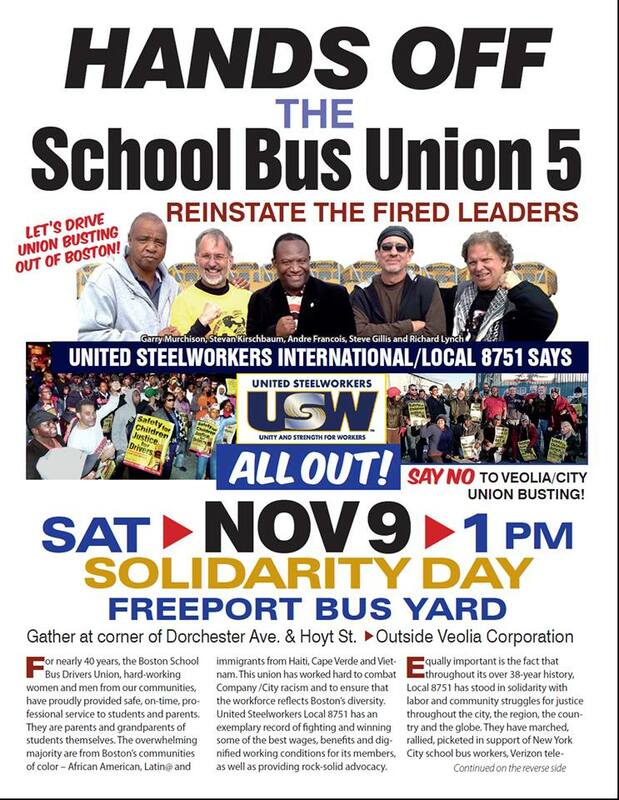 Over the next few days Veolia suspended 5 officials of the union - the United Steelworkers Local 8751. All 5 were sacked, 1 later re-instated. This was along with the small matter of disciplining another 864 drivers. The School Bus Union 5 are Stevan Kirschbaum, Andre Francois, Steven Gillis, Garry Murchison and Richard Lynch. While Veolia's arrogance leads it to run roughshod over the workers' rights, the company hadn't taken on board the strength of the workforce. This is clearly a workforce that is strong, united and won''t take being pushed around. The union officials clearly have overwhelming support. At the various hearings there have been massive rallies of support outside the Veolia offices involving 100s of union members. The union has build up strong links with other unions, and has excellent links across the community. There have been days of action where there have been well attended local rallies, along with pickets outside Veolia offices at cities as far away as New York, Baltimore and Oakland, California. This is a workforce that is united, strong, and determined to win. This determination should inspire more workers to stand up to rogue employers like Veolia. We all have a duty to support the Boston bus drivers. Here's to the victory of the Boston school bus workers, the re-instatement of the suspended and sacked officials, and the acceptance that Veolia start respecting all contracts, terms and agreements. No bus driver should be sacked � it is Veolia that should be sacked!